If you want to know how to treat cystic acne without medication, this page has the 6 vital steps you need! However, you may not feel comfortable using them. Whatever it is – you are in the right place! To treat cystic acne, you need to use the right skin care (details below), but you also need to go deep. Right to the very inside of your insides. Rebalancing your insides can help you to rebalance your skin. That mirror will look shiny, clear and new. A great way to do that is with a detox/fast. A detox or internal cleanse is the vital first step to getting rid of acne. This will allow your system to reset itself and start working properly. Nutrients and water are absorbed properly, toxins are removed efficiently, hormones remain balanced and all this shows up in your glowing complexion. 1. It’s important to prepare your body for a detox by including plenty of fresh vegetables, fruit and water for several days leading up to it. 2. You can do a juice fast – where you only drink fresh juices for 2 – 3days. You’ll be getting the nutrients from the juice while letting your digestion organs rest and reboot. 3. A full fast gives the most dramatic results in the shortest time. One day is enough (more than enough!) to get your system starting to run as it should. Drink plenty of water and rest as much as you can. 4. It is possible to get the same effects without fasting, it will just take longer and the results might not be as dramatic. Cut out all dairy, sugar, refined carbohydrates, caffeine and alcohol for at least 2-3 weeks. The impact of diet on your whole body can’t be ignored. If you truly want to get rid of cystic acne for good, you will need to make some changes – the results are well worth it. An easy way to get a good amount of vitamins and nutrients is by drinking a vegetable smoothie everyday. Spinach, apple, cucumber and pineapple is a tasty combination – experiment with a few different ones until you find your favorite. Smoothies are better than juices because they retain the important fiber and actually fill you up! If you can’t cut out sugar completely you need to understand the effects of it. Spikes in blood sugar levels disrupt hormones and have a direct effect on skin tissues and cells. Try to eliminate at least for 1 week, and then have it occasionally as a treat. It’s a great idea to keep a ‘food diary’ when trying any changes with your diet to treat cystic acne. Notice the effects on your skin and energy levels. How To:Omega 3 – from fish oil or flaxseed. Been shown to have a stabilizing effect on hormones, is very hydrating and good for mental health. Take 1500mg – 3000mg a day with food. Selenium – this mineral works as an antioxidant and some studies have shown a direct link between selenium deficiency and acne. Probiotics – these increase the amount of good bacteria in the gut, which is responsible for preventing infections and absorbing nutrients from food. Probiotics can be very effective for treating cystic acne. So we know exactly how important addressing the internal causes of cystic acne is. But that doesn’t mean you ignore the topical products you use. Treating it well on the surface will help prevent acne scars. In fact, they can make or break your results. 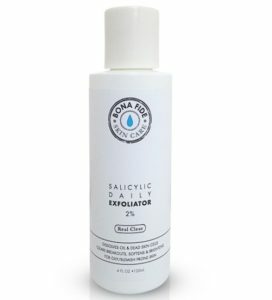 What Are The Right Products For Cystic Acne? Hydration and protection to allow skin to rebalance, stay comfortable, and improve it’s long term health (and appearance!). Stress has a direct impact on the functioning of your organs. Vital energy is used up and the results show on your skin. Gut health is related to mental health – so by taking the detox, diet and supplementation steps above you might find your stress is naturally controlled better. Sometimes temporary stress is unavoidable – before exams or a job interview, deadlines for projects, illness etc. Your acne might flare up during these times. It’s important to pay particular attention to the life style factors below, and ask for support from those close to you. These are just as important as all the treatments above, are just as important in the holistic approach. 1. Adequate sleep – this not only means enough hours (min. 7) but also quality. A dark room, clean sheets and healthy diet will ensure your sleep is deep enough to allow your body to reset. 2. Exercise – at least 20mins a day. It doesn’t matter if it’s a walk or sprint, broken up in two 10min lots or all at once. Just get it in anyway you can and your skin will thank you. It helps with sleep and digestion too. 3. Fun, relaxation and goals – while it’s easy to brush these off in the importance scale, if you suffer from cystic acne there is a chance that it’s been a long time since you felt at ease, inspired and motivated.